Tree, shrub & hedge Maintenance is very important. 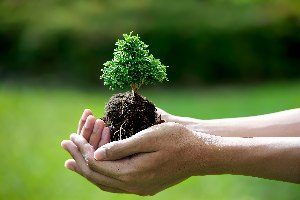 Whether you’ve planted trees and shrubs on your property or inherited them from a previous owner. It’s important to keep up with their care so they live their longest, most beautiful and productive lives. A New Leaf Tree Service can add you to our maintenance service. Maybe you have a blank slate and wonder how much time and effort it will take to plant and tend trees and shrubs. First, use this tree and shrub maintenance calendar for an idea of what’s involved (found below maintenance calendar). Then, ponder the work involved and the time it will take. Finally, call A New Leaf Tree Service to discuss the needs that can be handled by us, saving you time and energy for other important things in life. Don’t forget pruning! Following the correct pruning techniques for your trees and shrubs is crucial. Your plants will look better and produce more flowers and fruit. Pruning can rejuvenate old shrubs and train a tree to grow properly. A New Leaf Tree Service will maintain your tree’s, shrubs & hedges for you. Prune summer-flowering trees and shrubs that bloom on new growth, nonblooming broadleaf evergreens, and evergreen or deciduous hedges. Also prune hybrid tea, floribunda, grandiflora, shrub, and miniature roses. Remove winter-killed growth from roses. Prune spring-flowering shrubs immediately after their flowers fade. 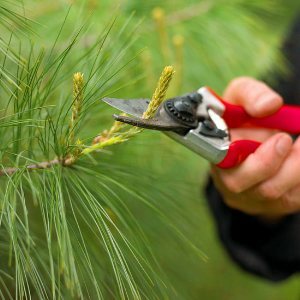 Pinch or trim half of the candles (new elongating shoots) on pines and other needled evergreens to slow their growth or make a bushier tree. Shear deciduous or evergreen hedges. After they bloom, prune mature climbing roses that are more than two or three years old and rambling roses. Prune dogwoods, maples, walnuts, and yellowwoods for size and shape, if needed. Prune summer-flowering shrubs and trees as blossoms fade. Trim long rose canes; if they remain, winter wind can damage the canes and objects nearby as wind whips them. Prune berried shrubs or trees by harvesting them for holiday decorations. 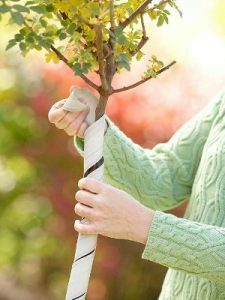 In late winter or spring, prune deciduous trees, fruit trees, and deciduous shrubs that are not spring bloomers, but make sure the temperature is above 20 degrees F.
In most parts of North America, early spring — while deciduous trees are still leafless and dormant — is the best time to plant. Autumn or winter planting is recommended in areas where summers are extreme and winters are mild, such as parts of the South and West. Spring is the only time you should plant bare-root trees in northern climates. Balled-and-burlapped trees should be dug from nurseries in early spring and can be planted in yards in spring or early summer. Container-grown trees can be planted successfully almost any time of the year, except when the ground is frozen. There are a few exceptions. Trees with active, late-winter sap flow, such as birch and sugar maple, should be planted after their sap flow ends, just as the leaf buds begin to unfold. Fleshy-root trees such as magnolias should be planted after their leaves have expanded slightly. Evergreens are best planted in early autumn, after summer heat is gone but early enough to get established before winter sets in. Although you can plant trees and shrubs almost any time the ground can be worked with a spade, avoid planting in late spring, right before hot summer weather, and in very late fall, because roots may not have enough time to get established before winter weather. Trees need to move and bend with the wind to develop strength. When they’re staked, they don’t develop strong trunks from the stake on down. They also are more subject to breakage from wind because the entire tree isn’t allowed to move as much. Rubbing and girdling from stakes and ties can affect the trunk as well, creating wounds that are susceptible to attacks from diseases or pests. The tree may also grow too fast with an underdeveloped root system. There are a few exceptions. Bare-root and large balled-and-burlapped trees may not be able to support themselves at first, especially in windy settings. After planting, watch the tree to see if it tips or leans; if so, it may need temporary anchor staking. Each tree needs at least three stakes. Broad, soft tie materials (such as nylon stockings or elastic webbing) are fastened from the tree to the stake. Avoid using wire, string, or other materials that can cut into the trunk. Remove the stakes as soon as possible. Research shows that almost all trees staked for more than two years have a higher probability for breakage. Tree wrapping in winter months protects against sunscald, not cold. It’s unnecessary for most trees, but it’s helpful in protecting young, thin-bark trees, such maples and fruit trees, for the first winter or two after planting. A rule of thumb is to wrap the tree at Thanksgiving and remove the wrap at the spring equinox (around March 20). Always remove tree wrap in spring to avoid a spot where insects can gather and disease can take hold. To protect established trees from winter critters, create a barrier fence a couple of feet away from the trunk using stakes and mesh screen or plastic tree wrap. You can wrap the trunk itself with chicken wire or plastic wrap that has air holes for circulation, or a plastic drainage tube slit down the side to loosely cover the trunk. Again, always remove any barriers in the spring. Protect evergreens from drying winds and sunscald with burlap screening or wrapping on the south, southwest, and windward sides. Antidessicant sprays can help but may not be fully effective in all cases. During the first year after planting, water is the most important element in tree and shrub survival. Always water deeply and thoroughly, even if less frequently; avoid frequent, shallow watering, as the roots will travel to the surface to receive the water and won’t establish themselves deeper. Place a hose at the base of the tree and allow a trickle of water to flow for at least 15 minutes. Shrubs can be watered for less time. If you have sandy soil, water more frequently; if you have heavy, clay soil, allow more time between waterings. Autumn is the most important time to water trees and shrubs, especially evergreens. Water during the growing season during periods of drought, particularly the first year or two while the plants are getting established. Good news: Fertilizing is one thing you probably don’t need to do! Most soils have enough nutrients to grow trees and shrubs. Only fertilize for specific elements when a soil test indicates nutrients are missing. A 2- to 3-inch-deep ring of mulch that extends to the drip line of a tree (the reach of the branches) is a great way to conserve moisture and suppress weeds that compete with tree roots for water and nutrients. Keep the depth of the mulch at 4 inches or less to avoid trapping too much moisture, which can kill roots. Organic mulches such as shredded or chipped bark decompose, adding nutrients to the soil. Mulch is also helpful in keeping lawn mowers and other equipment away from trunks. Avoid mulch “volcanoes” where mulch is placed in a cone shape directly against the trunk of a newly planted tree. Too much mulch directly against the bark causes rot, circling roots, and disease problems. 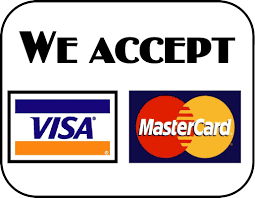 Give us a call to discuss your needs and how we can help you arrive at a beautiful and health environment.